Pack 37 is a part of the Red Cedar District of the Hawkeye Area BSA. We serve the College Community School District including Shueyville, Swisher, Fairfax, Walford, Ely, South Cedar Rapids and surrounding areas. Our Pack meetings are on the first Tuesday of each month during the school year starting at 6:30pm. We meet at the Shueyville Methodist Church. Individual Dens meet on a monthly basis with varying dates. These include Tigers (1st grade), Wolf (2nd grade), Bear (3rd grade) and Webelos 1 and 2 (4th and 5th grade). For more information please contact us at Pack37CubScouts@gmail.com. 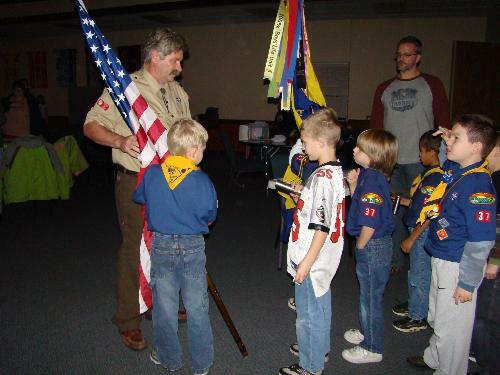 Pack meetings (for all Scouts, all ranks) are on the 1st Tuesday of the month at Shueyville United Methodist church. Normal time is 6:30-8:00pm. Please see event calendar for specific dates and times for each event. Parents are encouraged to participate with their scout. All meetings are at Shueyville Church. If you have questions or would like to receive a registration packet, please email Pack37CubScouts@gmail.com or call Kristi Urich at 319-400-7967.